The shop will be closed from April 16th to May 11th. All the orders which are placed in this period will be shipped after May 11th. If you have any questions, please send me a conversation. 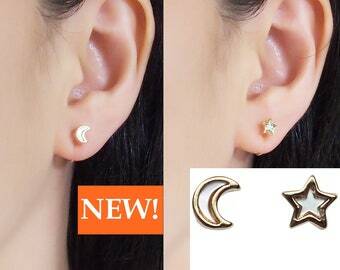 Welcome to my shop, MiyabiGrace, comfortable and pierced look invisible clip on earrings (non pierced earrings) shop! 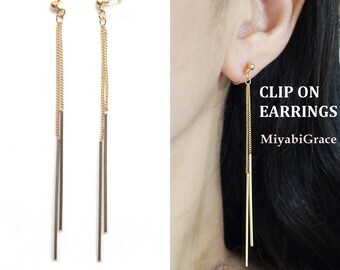 I provide invisible clip on earrings which is popular in Japan. I don't get my ears pierced and had a hard time to find an ideal clip on earrings. 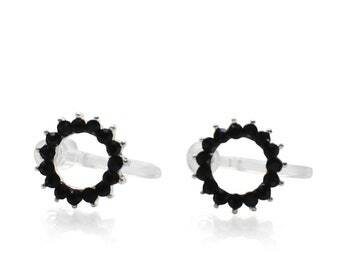 I always looked for pierced look clip on earrings. But if they are pierced look, they hurt my ears a lot and I can wear only for one hour. And I thought there are many people in the world that people have the same experience. In order to make clip on earrings wearable, I created and provide invisible clip on earrings. What are the invisible clip on earrings? They are clear resin clip on earrings and soft. So they are LOOK LIKE PIERCED and PAINLESS clip on earrings. You can wear them comfortably for entire day! Innovative products! I would like to introduce the various style of cotton pearl jewelry. My shop provides a wide variety of sizes and colors which make you satisfied. You can find your ideal and original items in my shop! 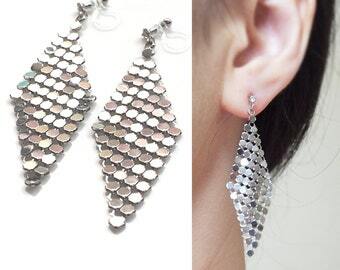 ★I mainly use hypoallergenic titanium earrings because I want to all the customer to wear earrings safely. 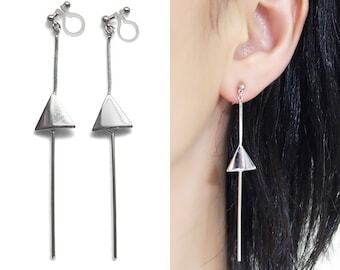 Titanium earrings are popular earrings in Japan. ★Item will be in black gift boxes with pink ribbon or pink gift boxes. Canada: USD $20.40 shipped by EMS express ( Estimated delivery time is around 6 to 10 days). I am sorry that we don't provide registered mail service to Canada since it will take more than 1 month to deliver. Second purchase: no additional shipping fee! ★When you purchase some items online, you are worried if they are exact same ones as pictures. I have this experience and made so many mistakes about online shopping. So I provide 30 days return and exchange services. If you are not satisfied with my jewelries, you can return or exchange. If you want to know more details, please read shipping and policies displayed in the third column for each item page. ★When you purchase some items online, you are worried about the quality of products and services. Even if the products seem nice, there might not be good customer services. 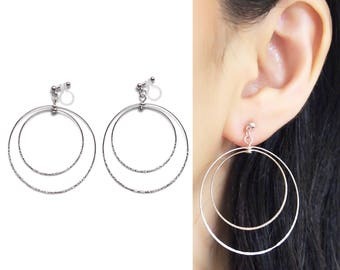 And you might think invisible clip on earrings might not as comfortable as describes since they are totally new to you and there is no proof. I understand your feeling. So please visit my shop reviews below and you can find customer's comments about products. ★I am responsible for the lost and missing parcel. So If your parcel is reported as lost or missing, the replacement will be shipped to your place. More details, please read the policy. ★If you want to use a credit card for payment, please send me a message. 💕💕If you have your gorgeous pictures with MiyabiGrace's jewelries and you would like to share in my Instagram, blog and facebook, please send them to me via conversation. If you let me know your social network account, I will tag you. Please enjoy looking at my items. 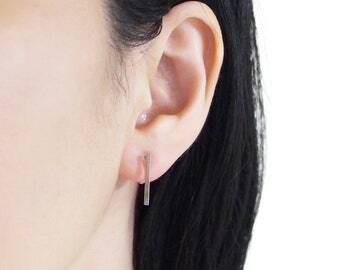 Silver Stick Invisible Clip On Earrings. Elegant Lightweight Small Resin Transparent Clear U shape Ear Plug Plastic Clip On Earrings. These are perfect! Thank you so much! They look amazing, it genuinely looks like I have pierced ears! Super speedy delivery, will definitely be buying more! It all came nicely packed and it looks exactly like the photos! 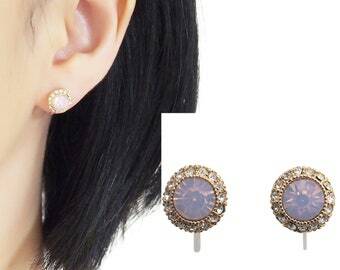 Are you looking for some gorgeous invisible clip on earrings? What about these? 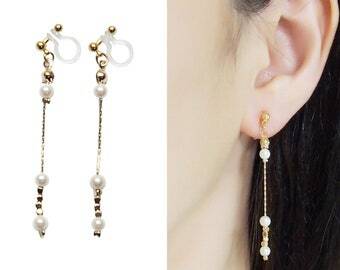 Elegant white pearl and rhinestone gold invisible clip on earrings are back in stock. 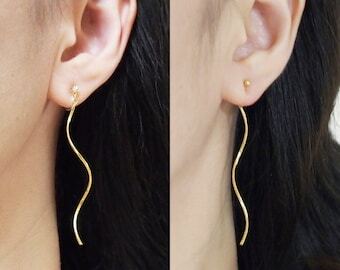 You can wear invisible clip on earrings for entire day! 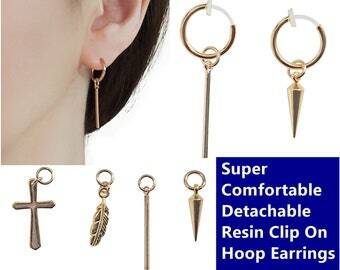 Wide varieties of invisible clip on earrings are provided! Ideal clip on earrings for wedding and special events for you!! 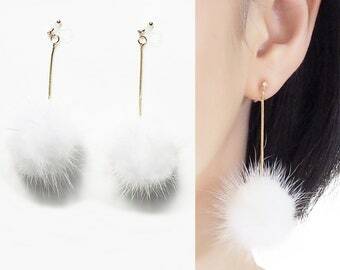 Welcome to cotton pearl and invisible clip on earrings shop, the masterpiece of Japan! Hello! I am Jennifer and live in Osaka, Japan. I am designer and creator. I mainly create cotton pearl jewelries and invisible clip on earrings which are trendy style of jewelries in Japan. I would like to provide up-to-date style of Japanese jewelries. I think there are a lot of you who have no idea about cotton pearls, so I would like to explain. Cotton pearls are compressed cotton with pearl coating. So they are extremely lightweight and have vintage look. These pearls were invented in Art deco era in order to lighten the weight of heavy pearl necklace. 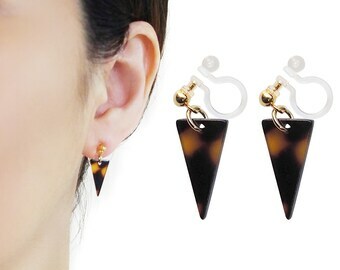 Therefore, even in big size, the weight is super light and you will forget the fact that you are wearing earrings. So my customers enjoy large pearl necklace and earrings since they are lightweight. There is only one cotton pearl manufacture in Osaka, Japan and they are rare pearls. 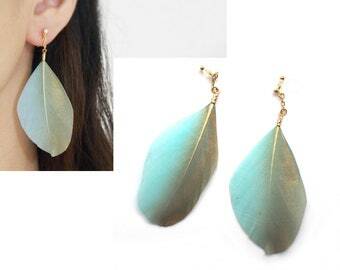 In terms of invisible clip on earrings, many of my customers are satisfied with qualities. They are innovative products from Japan and main stream of clip on earrings in Japan. I would like to explain how different from regular metal clip on earrings to invisible clip on earrings. Many of my customers have some reasons not to get ears pierced and been looking for their ideal clip on earrings. 1)	Too painful to wear clip on earrings from the pinching. Even if they found stylish clip on earrings, they can wear for 2 hours since clip on earrings pinch and hurt their earlobes a lot. Sometimes the pain cause headaches. Of course, our customers hesitate to wear them casually. 2)	Obviously they are clip on earrings and clunky. 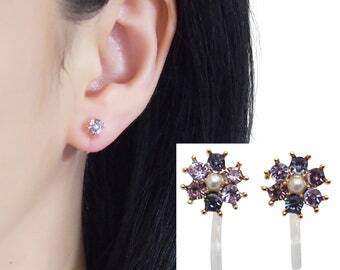 If the customers love delicate and sophisticated earrings, it is hard to find pierced look clip on earrings. 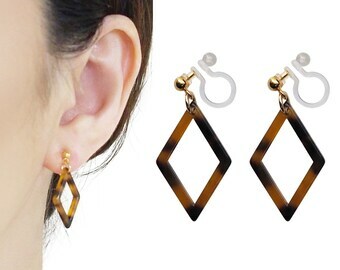 The metal clip on earring parts are seen and they are clip on earrings at a glance. 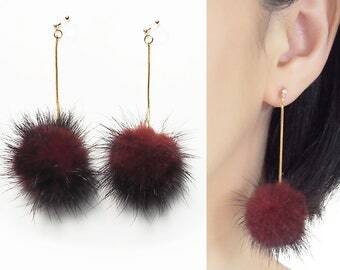 Sometimes, these earrings ruin their style. 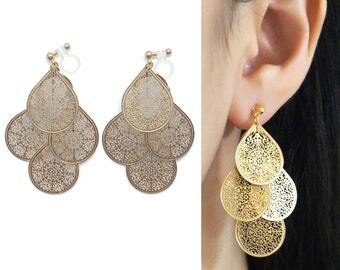 Most of earrings which are available on the market and online are pierced earrings. There are not so many clip on earrings in their local retailers. There could be some vintage clip on earrings online, but most of them wear up-to-date stylish clip on earrings. Then, I provide invisible clip on earrings which solve all of 3 problems. Invisible clip on earrings are made from resin and soft. So they fit your earlobes and barely feel pains. Many of customers now that wear clip on earrings for entire day and every day. So they wear my invisible clip on earrings like pierced earrings. 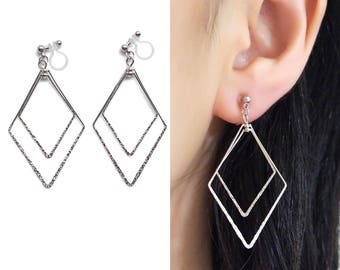 The invisible clip on earring findings are clear, so they look like pierced earrings. Even if you wear stud style clip on earrings, the earring findings are almost invisible, so they look like pierced stud earrings. 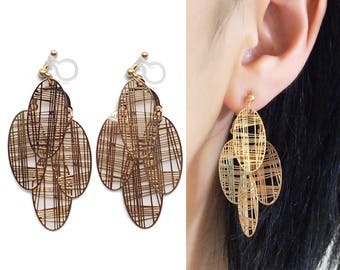 Many of customers love these style since they can wear them tiny and casual clip on earrings every day. They enjoy dream like earring life. 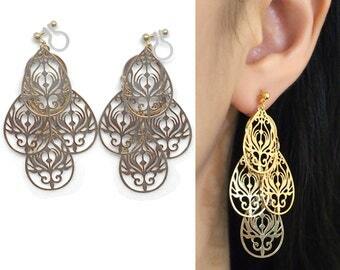 My customers enjoy various style of invisible clip on earrings. 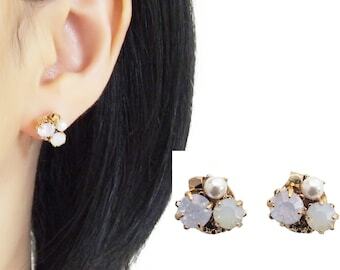 There are stud, dangle, Swarovski crystals, large filigree, freshwater pearl, gemstone and cotton pearl invisible clip on earrings. They pick up different style of invisible clip on earrings for different occasions since my shop has variation. I love hearing from customers that they wear invisible clip on earrings every day and want to contribute to their happy fashion life. I would like to explain details for my shop policy in order for you to purchase items safely and comfortably. If you have any unclear points, please feel free to ask me. 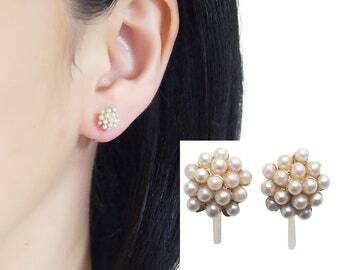 I use unique Japanese high quality materials to create jewelries such as cotton pearls and invisible clip on earrings. They are hard to obtain at your local stores. I would like to introduce more Japanese original items and add excitement to your life! 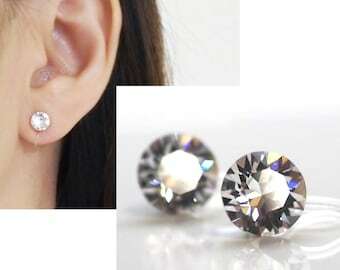 For example, invisible clip on earrings are pierced look and comfortable clip on earrings. And they are wearable for entire day. So clip on earrings are not for your big days anymore. They become every day wearable earrings. If I can contribute to your life by introducing Japanese innovative products, I will be happy💕. ✨You might think buying jewelries online is doubtful: you are worried if they are exact same ones as pictures. I have this experience and made several mistakes about online shopping even though I paid so much attention to check item’s pictures. 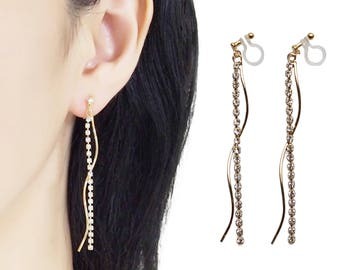 And it is skeptical if invisible clip on earrings are comfortable compared with regular metal clip on earrings since you have never seen and tried them before, isn’t it? I have same experience and totally understand when I found invisible clip on earrings in Japan. The best solution is to see and try them. So I provide ★30 DAYS RETURN and EXCHANGE services★. If you are not satisfied with my jewelries, you can return or exchange and please contact me within 30 days after receiving of your parcel. 1)	If you would like to exchange items, the return shipping fee is customer’s charge and new item shipping fee is my charge. The items should be in original conditions. 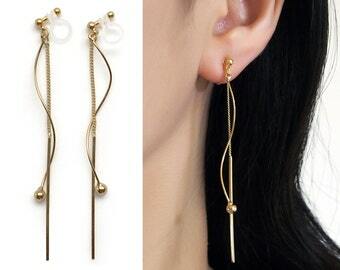 In terms of invisible clip on earrings, please try them. Right after I received your parcel, I will ship new items. 2)	If you would like to have refund and no exchange, please return the parcel to indicated address. The return shipping fee is on your fee. Right after I received your parcel, I will refund the full amount of the items. Shipping fee will not be refunded (shipping fee from Japan to your place). I will ship new items and I will pay shipping fee. If the items are broken or damaged, I appreciate it if you can send me a pictures for future improvement of products and shipping. You can checkout without PayPal account. Except if the items purchased are impossible to recreate since the findings are not available anymore. In this case, I will issue refund or exchange to other items and ship them to you. ✨All the parcels are shipped from Osaka, Japan. It is doubtful if the parcel will be delivered to your place safely, isn’t it? Don’t worry, I am responsible for lost or undelivered parcel. If they are reported as lost or undelivered, I will ship again to you. ✨ All the package will be shipped by registered mail with tracking number. You can track your package on Etsy tracking system. If you are in hurry, I recommend purchasing express delivery service of EMS. When you check out, please choose "Shipping upgrade". ✨Right after payment is confirmed, I will ship your items. If you don’t receive items within estimated delivery day, please follow these instructions. 1)	Check the Etsy’s track system and check the location of your parcel. 2)	If you found something wrong, please inquire local post office with tracking number which is on shipping notification. 3)	If the postal office staff said that they could not track, please contact me. I will inquire the Japan post about the location of your parcel. ・Import duties, taxes and charges are not included in the item price or shipping charges. These charges are the customer's responsibility. How long does it take to receive my order from Japan? How can I receive order faster? When you check out, please choose “Shipping upgrades” EMS express expedite service. These are additional charge for EMS express service. How long does it take to receive my order by EMS express service? United States, Canada, United Kingdom, Europe, Australia, New Zealand, Singapore, Hong Kong, and other Asian countries. What is the invisible clip on earrings? 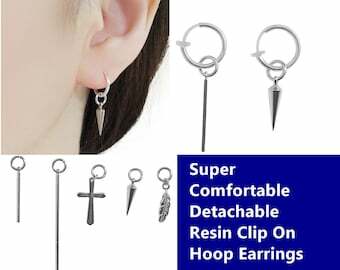 What is the difference between normal metal clip on earring and indivisible clip on earrings? 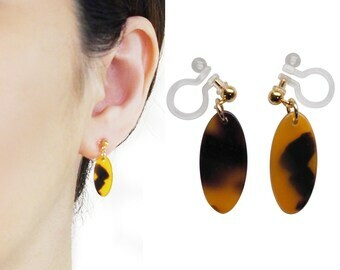 Invisible clip on earrings are resin made clear clip on earrings. 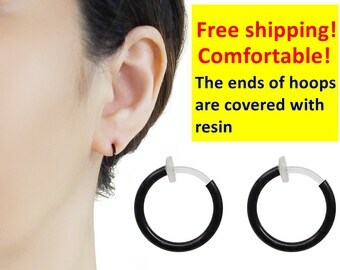 Since the earring findings are resin, they are soft and fit your earlobes. 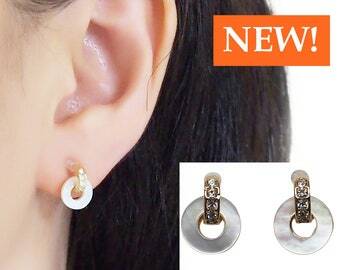 Therefore, they are more comfortable than ordinary metal clip on earrings. Moreover, the earring findings are clear, they look like pierced earrings. What type of payment is available? We accept PayPal and all major credit card via PayPal. 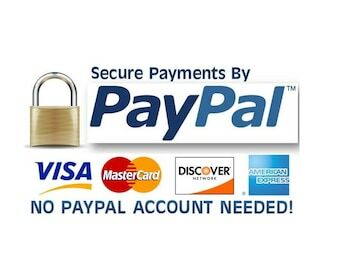 You don’t need to have your own PayPal account for payment with credit cards. 1) Enter items into your shopping cart ➡2) Go to shopping cart page by clicking on cart (top right) and find your order. Choose PayPal as your payment method. Click "Check Out with Paypal" ➡3) A PayPal payment screen will open, roll down and click: ''Don't have a PayPal account?'' ➡4) Please fill in your credit or debit card and other required information for payment. Yes, we do. All the items are put in the gift box and will be shipped to you. I want to buy more than 1 item! The shipping fee will be charged more as the number increased?